The firm Scafo System offers both small- and mid-sized formwork for rent. Floor props – galvanized, with minimum carrying capacity of 20 kN and height adjustable from 150 to 550 cm. Vertical formwork - mid-sized pole shuttering system with the weight of 30 kg/m2 and built-in wedge sealing system. Thanks to this system, poles can be formed with the side width ranging from 25 to 60 cm in modules placed every 5 cm. Permissible concrete pressure is 80 kN/m2. Mid-sized formwork - modular with the weight of 30 kg/m2. This formwork is used for shaping any structural elements of concrete. 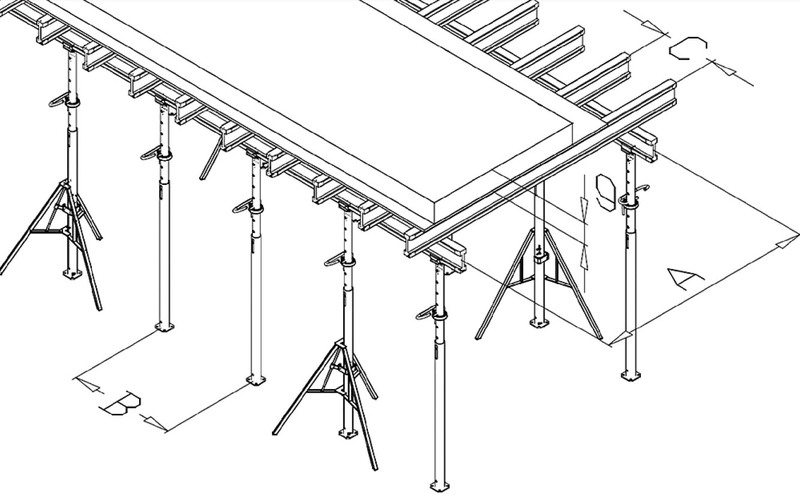 Formwork is easy to install (installation does not require the use of a crane). Permissible concrete pressure is 60 kN/m2 without extension, and 55 kN/m2 with extension. Small-sized module formwork with the weight of 25kg/m2 and with sheathing made of phenolic plywood. Formwork is particularly effective in forming concrete elements such as strip foundations and foundation walls, fencing and ground beam foundations, footings, reinforced concrete pillars and others. We offer the rental and installation of Warsaw scaffolding, frame façade scaffolding. System scaffolding: with longitudinal spacing of the frames: 3,07 m; 2,57 m; 2,07 m; 1,57 m, as well as with two standard transverse spacing of the frame stillage: 0,73 m and 1,09 m.
We offer rental, delivery and installation of panel fencing. We offer rubble chutes, both for sale and rent. We offer construction containers for rent.